Here at the end of July, we’re having a little break from extreme heat, but there’s still quite a bit of summer to go so when it comes to the hot factor, we point to baseball great Yogi Berra’s saying that “it ain’t over ’til it’s over.” There’s still plenty of beach time, camping time and general fun-in-the-sun time yet to go. If you’re not prepared for the summer heat, it can be more than just uncomfortable – it can be dangerous. Heat danger comes in many forms and ranges across a whole spectrum from inconvenient and itchy to downright deadly. Thinking ahead and being properly prepared and equipped will help you maximize your fun in the sun. It can’t hurt to be reminded of the basics: stay hydrated, wear sunscreen, and know when to retreat to the shade. Beer, sadly enough, is not hydrating. Drink plain old water. (Sports drinks aren’t significantly better than water for hydration, either.) Sunscreen is a must for everyone who plans to spend any length of time out in the direct sun. Even the darkest skin is prematurely aged by the sun’s ultraviolet (UV) rays, and while dark skin does offer some protection against skin cancer, the risk is still present. If you’re heading out to the beach, check to see if beach umbrellas are available or take your own. You can’t count on the clouds to cover the sun when you need to sit in the shade and cool off. Once you’re out in the sun, you’ll want to know how to recognize the signs and symptoms of different heat-related illnesses. Heat exhaustion, which can be effectively addressed with cooling and careful rehydration, can look a lot like heat stroke, a serious and possibly deadly condition requiring urgent medical attention. 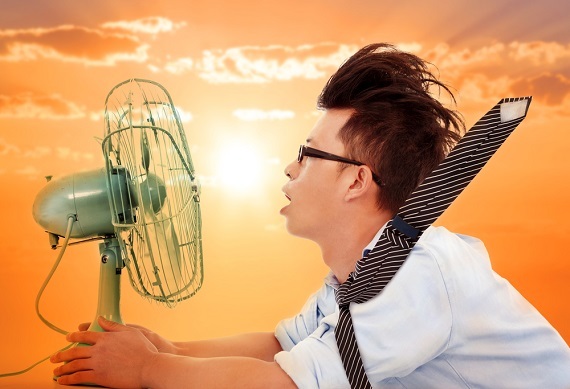 Knowing how heat affects you can help keep you safe when the sun is blasting down. Here’s some stories from some people who were going about their daily business, and suffered illness or collapse due to excessive heat. Learn from them – plan to keep cool when things heat up. Keep an eye out for those you care about who may be susceptible: kids who may not be aware of the danger, the elderly, outdoor workers — even your pets. 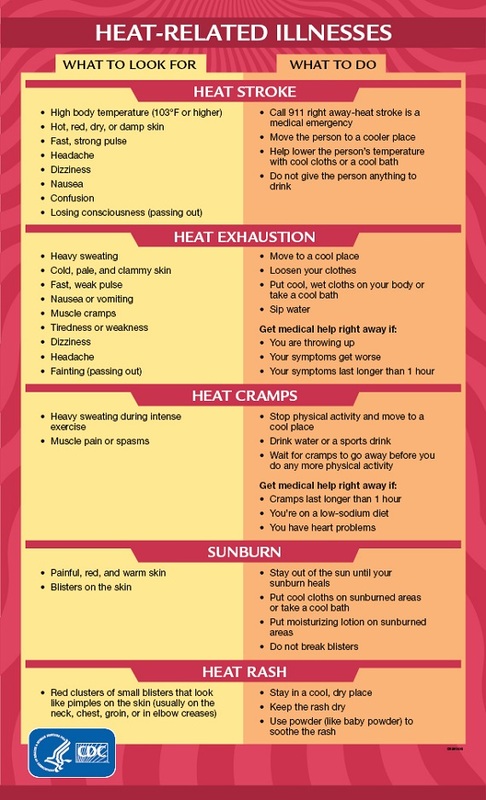 Get tips about how to deal with extreme heat from the National Weather Service and here’s a helpful chart from the CDC breaking down the signs and symptoms of heat-related illness.